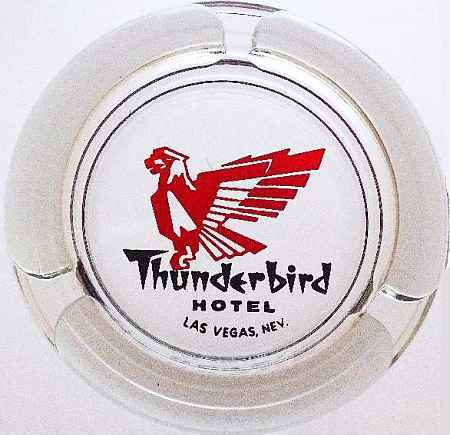 Vintage Ashtray from the Swingin’ Sixties Thunderbird Hotel & Casino in Las Vegas, Nevada. A fabulous piece of 1960’s advertising memorabilia from an era long gone by. One of the small handful of original casinos that was built on the Las Vegas Strip, the Thunderbird has been closed for over thirty years. The artwork on this heavy clear glass ashtray shows a bird outlined in red with black lettering on clear glass. Ashtray is about 4 inches in diameter, with 3 cigarette rests, and is in excellent condition, without chips, cracks, blistering, etc. This piece is a real rare treasure!